Donald Lu, war Reise Begleiter zu einem Termin mit Obama in 2016, obwohl Alles bereits mit den neuen Drogenkartellen bekannt war. Former Interior Minister Saimir Tahiri gave up his deputy mandate today, after a speech in which he attacked the current minister Fatmir Xhafaj and US Ambassador Donald Lu. “We are listening about big fish that will be caught, some speak about gangs in the parliament, ambassadors speak up and down about Mafiosi”, Tahiri said in front of media reporters today. “The Interior Minister is counting the gangs on television, such a horror that makes you grab your baggage and run away”. 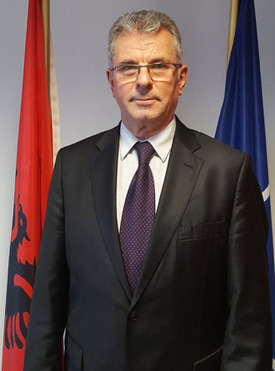 It’s unknown why Tahiri decided to speak against his former friend and promoter Ambassador Lu, who has never said a word about Albania’s cannabisation during Tahiri’s tenure as Interior Minister. 500 Polizeibeamte schieden freiwillig aus dem Dienst, vor Ablaufen der Frist, Vermögens Auskunft zugeben. Viele Kriminelle kauften sich Polizei Post, oft mit anderen Identitäte, trotz Vorstrafen. Approximately 500 State Police employees out of a total of 13 thousand have resigned five days before the deadline to file self-declaration documentation.These data were made public by the State Police Employees Labor Union, who believes the remaining five days will also be accompanied with more resignations. According to the statements of the Union’s leaders, the resignations come about as a result of the complicated process of filling out the self-declaration form and insufficient time.Police employees have stated that it is difficult to gather all the necessary documentation to justify the wealth they have accrued throughout their work years within the time window provided by the Ministry.In several interviews, the Vice Minister of Interior Affairs has declared that no documentation is needed for outside income up to 1.5 million lekë, but Police employees claim that no such official directive has been given, so they continue gathering their documentation. The deadline to file self-declaration forms and accompanying documentation is May 7. The State Police vetting was proposed by Minister of Interior Affairs, Fatmir Xhafaj, in October 2017, and the law providing the ways in which it would be executed was approved by the parliament in March 2018. Journalist Artan Hoxha erklärte heute Abend „Opinion“, die Saimir Tahiri ein Risiko für die Mehrheit stellt, wenn sie zu sprechen entscheidet. Hoxha sagte im Studio von „Opinion“ zeigt, dass, wenn Tahiri sprechen wird, fällt die Mehrheit. Er sagte, dass heute Saimir Tahiri Nachricht mehrere Namen Mehrheit gesendet wurde, eine offene Bedrohung impliziert. Journalismus Tahiri betonte, dass eine Bedrohung für die Mehrheit darstellt. “ Von diesem Moment an ist Tahiri ein leidenschaftlicher Mensch und aventuarave nach aus den Gruben gerade im Entstehen Mali gehen. Er muss sicherstellen , dass von heute, er vorsichtig sein sollte für das Leben der Fall ist. Da eine Bedrohung für die Mehrheit. Ja Tahiri sprach Zusammenbruch der Regierung “, -deklaroi Hoxha. Alles Show des Edir Rama. sogar der gerichtliche Hausarrest pger Gerichtsurteil, der Parlament Untersuchungs Bericht. Kurz gesagt, die Albaner, diese korrupte Justiz, Edi Rama Regeirung sind zu dumm, um überhaupt als kriminelles Enterprise, irgendetwas zu untersuchen, wo immer noch Drogen Depots bei Vlore an der Küste, Karaburun existeieren usw.